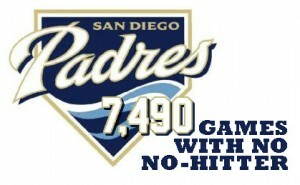 The San Diego Padres have finished the 2015 season without a no-hitter, marking the 47th straight season they’ve missed that feat since joining the National League in 1969. The Friars did notch one other rare feat this season, when Matt Kemp became the first Padres player to hit for the cycle on Friday, August 14, 2015 at Coors Field. The team had been one of two major league teams (the Marlins being the other) without a cycle.